Alicia Garc'a-Herrero has no doubts. Brazil has lost its status as a star economic and political performer in the emerging world. Indeed, if Brasilia hopes to reverse its fortunes it will have to reduce its fiscal deficits and cut down a bloated public sector. Such reforms, it goes without saying, will be painful. Brazil is no longer a star performer in the emerging world, in which the economy is slowing down and falling into an abyss. Rising inflation and weak GDP growth have placed Brazil in a dilemma regarding monetary policy, while the large fiscal deficit prevents the government from using any fiscal stimulus. 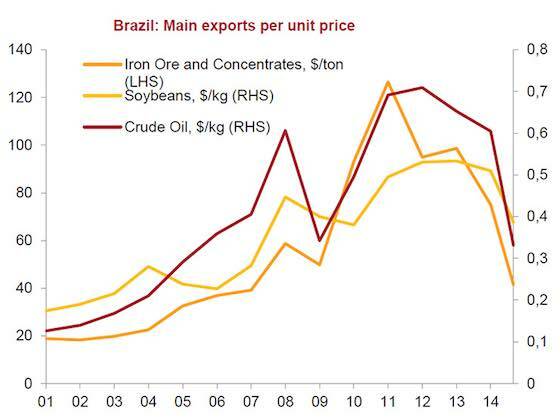 External shocks from the commodities market, China and the Fed have together stalled Brazil’s economic growth engine. Brazil is experiencing the consequences of a lack of reform during its golden age. The Dutch disease, poor infrastructure, low quality education and inefficient pension system are all obstacles to restart the economic engine. A shaky political situation, emanating from corruption scandals and political ties in state-owned enterprises (SOEs), has delayed the action needed for economic recovery. The options confronting Brazil are limited and short-term pain in recession is unavoidable for a better long-term future. Inflation has to be controlled at all costs and structural reforms are needed to rebuild local and international investor confidence. During the last few years Brazil has been perceived as a star on the wane but very few imagined the situation could worsen to the point we are at today. 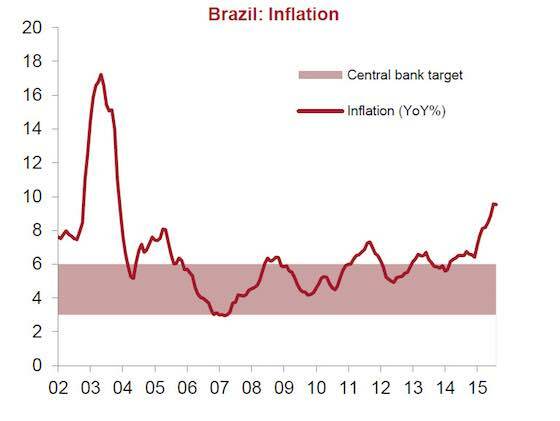 Over and above the treble external shock that has hit several emerging economies (a sharp fall in commodity prices, a slowdown in China and monetary policy normalisation by the Fed), there are a number of structural issues that place Brazil in an especially difficult position. First, after a successful macroeconomic stabilisation in the second half of the 1990s, Brazil is back to square one, with a mismanaged macroeconomic environment. The key futures are stagflation and a twin deficit (fiscal and external). Secondly, Brazil’s structural problems are acute and difficult to solve. Starting with the most recent, de-industrialisation stemming from the Dutch disease generated by the commodity boom, there are also even more deeply-rooted problems such as poor educational levels, a lack of infrastructure and a bloated government structure. As if this were not enough, the government is also facing a multibillion corruption scandal and the President’s likely impeachment. This paper dissects all of these issues, painting a gloomy picture of Brazil’s economic outlook, in three main blocks: (1) the country’s poor macro picture; (2) its structural weaknesses; and (3) its political situation with particular reference to the large-scale corruption scandal. Finally, its offers some potential solutions to Brazil’s current woes. Brazil is currently under a very difficult situation of stagflation, with inflation standing at 9.53% yoy in August 2015. 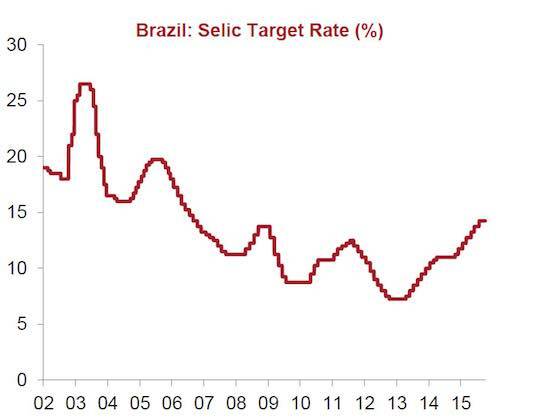 While most countries are enjoying the ride on falling energy prices, the normalisation of regulated prices in Brazil has raised inflation way beyond the 3%-6% target. The central bank has therefore been forced to raise interest rates to 14.25% despite the economic recession. Since its peak growth in 2010, the Brazilian economy has done nothing but decelerate, entering negative territory in 2014. Growth was -2.6% yoy in the second quarter of 2015, while there are no signs of improvement. Brazil has moved from a current account surplus up to 2007 to a growing deficit. The current account deficit is now at -2.3%, compared with an average surplus in the emerging world of 1.8%. 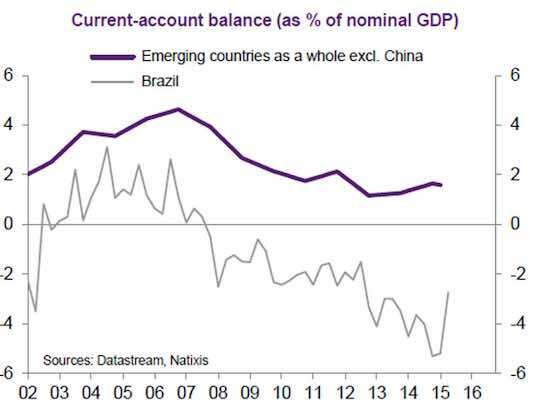 Brazil’s recent improvement in its current account deficit is a result of currency depreciation but also of the reduction in imports following the recession. 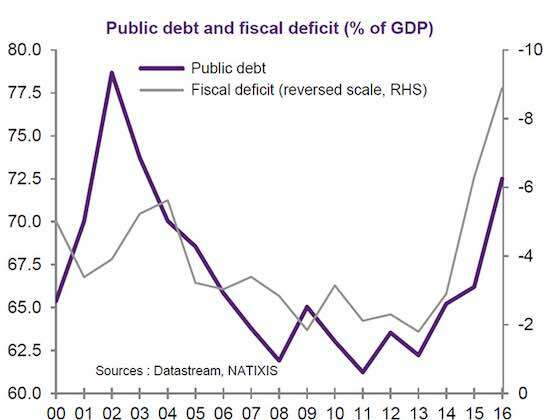 The fiscal deficit has deteriorated very rapidly, to 9% of the GDP, and pushed public debt further up, to as much as 10% of GDP, in only five years: from 62.5% in 2011 to 72.6% in 2015. One of the key reasons for Brazil’s growing budget deficit and sovereign debt level is its over-generous pension system. Failure to avert the fiscal deficit through pension reforms has implied a lower productivity, as people are discouraged from joining the work force, and potentially higher taxes in order to compensate the deficit. More importantly, this poses the risk of defaults in sovereign and corporate debt, which could lead to further downgrading and higher borrowing costs. Falling commodity prices, a slower demand from China and the potential Fed rate-hike together have played a key part in determining Brazil’s economic scenario. 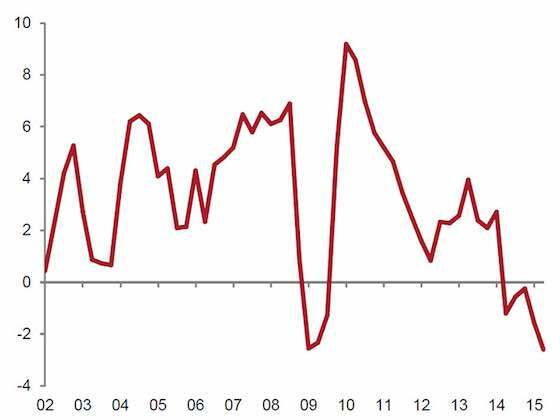 (b) China Brazil has enjoyed a honeymoon in export growth since the commodity boom and the strong growth in China since 2001. 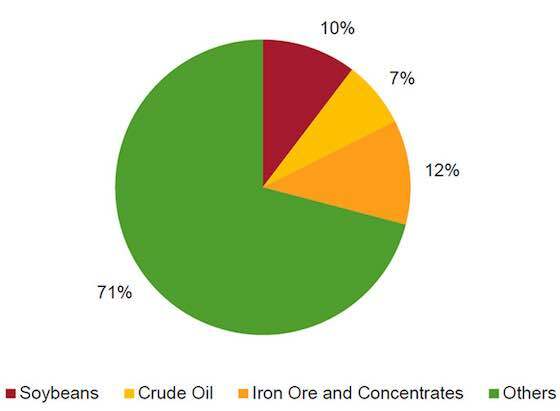 China is Brazil’s largest export market, accounting for 18% in 2014. Annual trade with China surged from US$1.9 billion in 2001 to US$40.6 billion in 2014, a 21-fold increase. With the slowdown in China, Brazil’s exports there have failed to maintain their growth momentum, with a 13% decline in 2014 and an even greater drop in 2015. 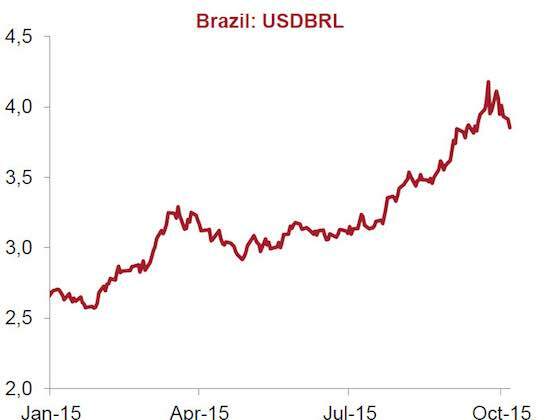 (c) The Fed The most direct impact of the Fed rate hike to Brazil is the depreciation of the real against the dollar. A weaker real also implies that Brazilian companies would have to pay more for dollar-denominated debt. For example, Petrobras had a debt of US$111 billion in foreign currencies, accounting for 83% of the total by June 2015. Investors have priced the default risk higher. 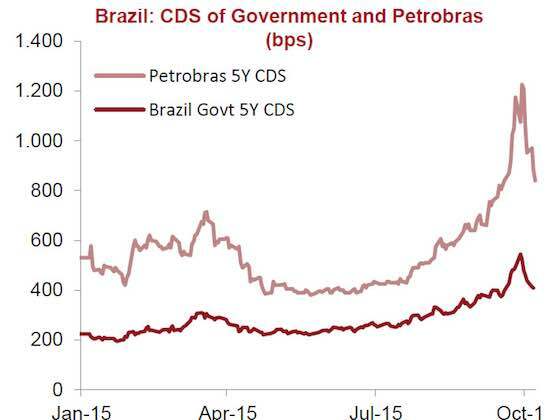 For instance, the spread of Petrobras five-year Credit Default Swaps (CDS) reached as high as 1225 bps at the end of September. The good news is that the delay in the Fed’s rate hike has given emerging currencies some breathing space, which is also reflected in the CDS market. 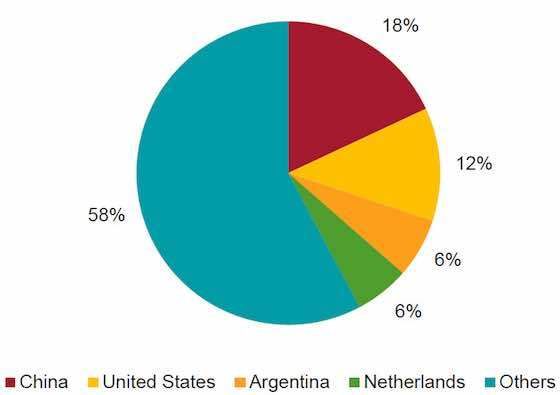 Dutch disease is no stranger to Latin American economies given their commodity dependence. The strong rise in primary sector revenues tends to lead to a loss of competitiveness in the manufacturing sector as prices creep up generally. The fast-growing Chinese economy has given Brazil access to a large market for commodities exports, but the flip side of the coin is the de-industrialisation resulting from competition from China. 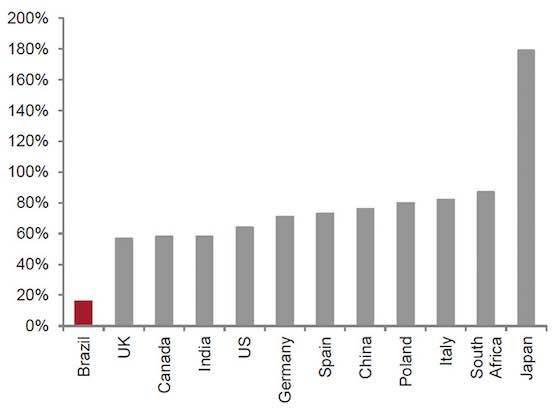 In Brazil the share of manufacturing in its GDP has declined from 18% in 2004 to 11%. 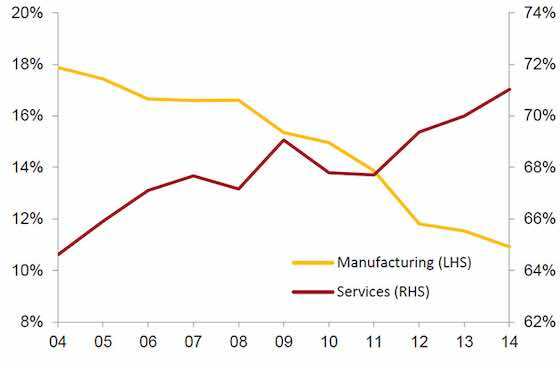 In the labour market, employment has also switched from the manufacturing sector to services. 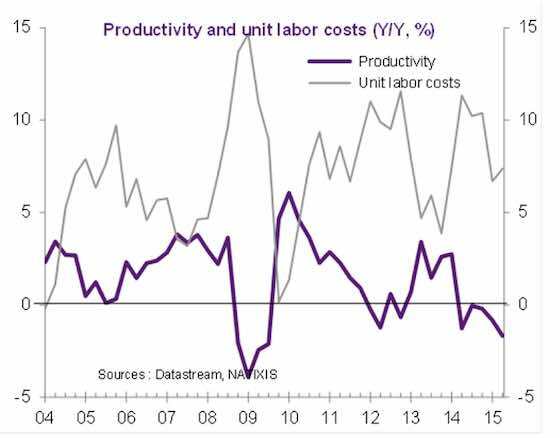 Meanwhile, falling productivity combined with more than doubled unit labour costs from 2001 to 2011 have put Brazil’s competitiveness at risk. Having a massive landlocked area with poor infrastructure is one of Brazil’s key bottlenecks for economic development. The natural geographical barrier and government bureaucracy have made it difficult for Brazil’s exporters to transport materials and goods from central Brazil to ports in coastal areas. 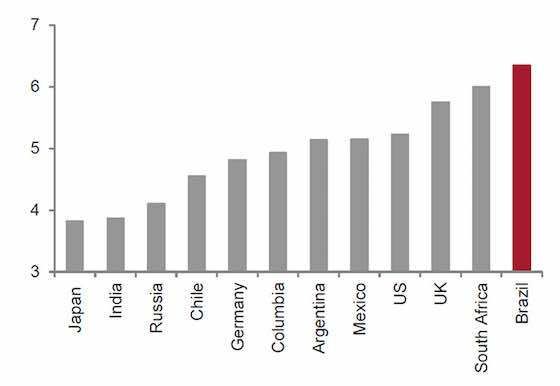 In fact, Brazil’s infrastructure investment stock accounts for only 16% of its GDP, which is significantly lower than for the rest of the BRICS including India (58%). China and South Africa stand far above, at 86% and 87%, respectively. When focusing on the quality of infrastructure, the situation is no better. In fact, Brazil scores 3.92 in the 2015-16 Global Competitiveness Report, lagging behind most of its peer BRICS and other South American countries. All in all, there is an urgent need to improve infrastructure to reduce time costs and risks. Brazil has increased its investment in education over the past decade and it is now one of the top spenders on education in terms of GDP. However, the increase in spending has not yet given Brazil a significant advantage, both quantitative and qualitative. 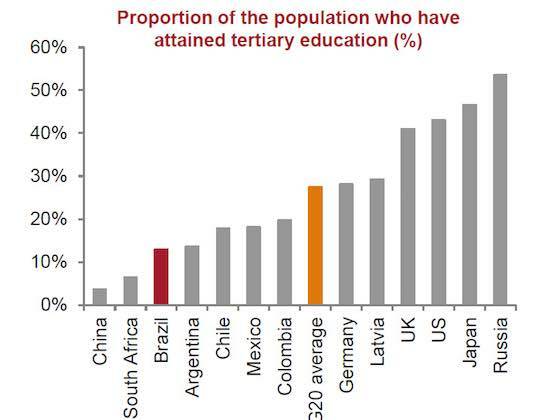 First, the share of the population who attain tertiary education remains low, at 13%, compared with the G20 average of 27%. 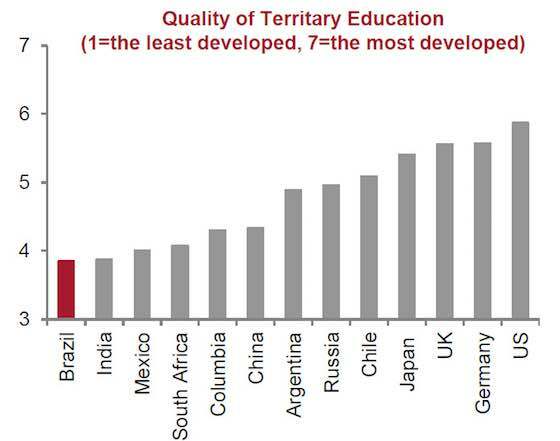 Secondly, the quality of education ranks very low even when compared with other emerging economies. Effective education is crucial for Brazil to improve its economic prospects. Brazil has a large public sector in which salaries and pensions make up the bulk of government spending. 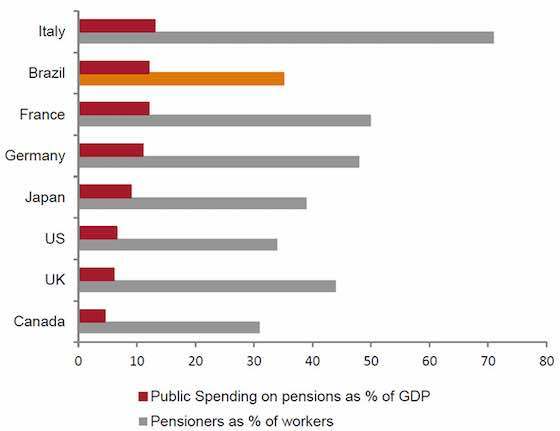 In terms of its pension system, Brazil is one of the most generous spenders on social security among the major economies, despite having a much younger population and a lower income per capita than others. The pension deficit is growing rapidly and the federal government has ruled out any expectation of a bailout, which could turn into a series of potential municipal debt crises. Not only large state-owned companies have clear governance issues, Petrobras and the Brazilian Development Bank (BNDES) being good examples, but the increasing share of credit that the state controls is also worrying. Petrobras, Brazil’s largest company, accounting for more than 10% of the country’s investment, is currently at the centre of governance scandals. Prosecutors are investigating an alleged kickback scheme of senior Petrobras executives and other large construction companies as well as the country’s ruling party. The state-owned development bank BNDES is Petrobras’s major shareholder, owning a quarter of the oil giant. Critics argue that the BNDES’s loans mainly go to large corporations, which raises the question of possible political ties. On the other hand, BNDES’s funding is attractive to businesses because it lends below the market rate, basically subsidising credit to large corporations. All in all, the ongoing corruption scandal is the combination of political ties and the lack of transparency in both government and state-owned enterprises. However, no action was taken during the good old days of the commodities boom to reform, leading to the current governance crisis. Since her re-election, Brazil’s President Dilma Rousseff has been struggling with a loss of public support and the inability to get reforms through Congress. Political instability is paralysing the Brazilian economy. The economic malaise has been deepened by the Petrobras scandal, known as ‘Operation Carwash’ as a petrol station was believed to be used as the location for the company’s money laundering. The Senate and Lower House Presidents are both under investigation in an alleged kickback scheme that funnelled money from the state-run Petrobras in order to secure lucrative infrastructure and procurement contracts. The widespread discontent with the impunity and corruption of government officials is feeding protest and undermining the support for the Rousseff government. 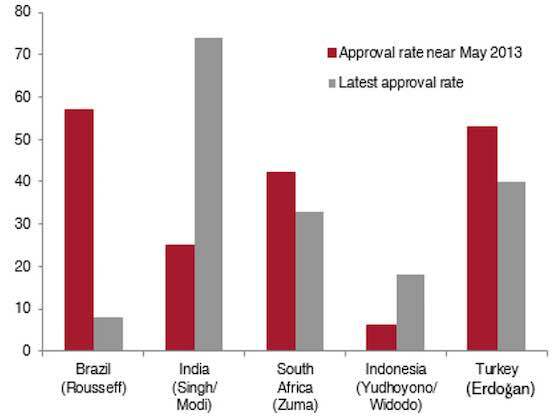 Rousseff has seen her approval ratings hitting 8% in opinion polls, the lowest for any administration since 1990. Protests have drawn hundreds of thousands to the streets, complaining of high inflation, the worsening economy and corruption scandals. Rousseff has brought Joaquim Levy back to the government as Finance Minister due to his well-known ability to cut public spending. Although the government had planned to revive the economy through fiscal reform, political turbulence has been an obstacle and raised concerns about the government’s ability to implement it. The corruption scandal has led to cracks appearing in Rousseff’s coalition, in which the Brazilian Democratic Movement Party (PMDB) is the key supporter of the ruling Workers’ Party (PT). Eduardo Cunha, President of the Lower House of Congress and a member of the PMDB, publicly opposed Rousseff by blocking austerity bills and promoting expenditure bills. However, he is currently also alleged to have offshore bank accounts. At such a difficult political juncture, a US$17 billion austerity package has recently frozen salaries, eliminated 10 out of 39 Ministries, cut 1,000 jobs and reduced social benefits. This has of course heightened opposition to the current government, forcing Rousseff to appoint seven PMDB members as Ministers in a government reshuffle in order to avoid impeachment. The problem is that Rousseff will find it very hard to keep government strategy under control. In fact, the Lower House has again approved bills to increase retirement benefits, resulting in higher government expenditure. To make things worse, Brazil’s top electoral court agreed to investigate Rousseff on allegations of illegal funding of her most recent re-election campaign. The country’s audit court also recommended Congress to reject the new fiscal bill, which could trigger an impeachment process, the first in Brazilian political history. To solve the problems generated by internal and external pressure, Brazil must control its fiscal deficit and inflation in the short term, undertake structural reforms in the economy and regain its regional influence. First, its fiscal condition needs to be improved to prevent further sovereign credit-rating downgrades. A further increase in borrowing costs from downgrading would be detrimental to Brazilian corporations. Monetary policy tools should be used to bring down inflation, even at the cost of an even greater recession in the short term. Secondly, an unremitting effort to push through structural reforms is necessary to bring the economy back on track. The role of SOEs in the economy should be reduced to increase transparency. The pension system, which is a huge burden for the government, should be reformed. Privatisation of SOEs and state-owned banks is essential, but it is also essential to improve the rules of the game to ensure an equal footing between the public and private sectors and local and foreign investors. Attracting foreign capital to upgrade infrastructures is also vital, as is the reform of the educational system. Finally, Brazil needs to find a new leading role in the region. With the Pacific Alliance (between Mexico, Peru, Colombia and Chile), Brazil is becoming isolated from the best-performing area of Latin America. An association agreement with the Pacific Alliance is long overdue. 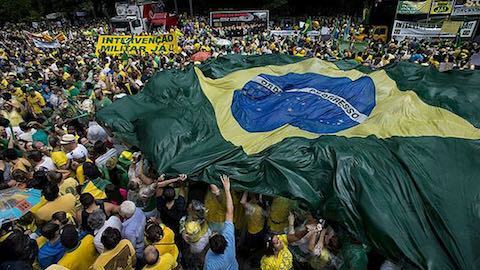 Over and above the very weak economic situation, it is political instability that is paralysing the Brazilian economy. While the boom years have not been used to support reform, Brazil is currently experiencing resistance to economic reform, especially as regards its austerity measures and the political ties in SOEs. The fact that Brazil’s credit rating has recently been trimmed to junk grade is a very clear warning that Brazil needs urgent fiscal and public sector reform. It is clear that President Rousseff is moving towards tightening policies. However, the road to reform is not easy in the current political climate. The question of whether Roussef’s impeachment might result in a better outcome for Brazil remains doubtful. All things considered, it can be expected that Brazil will remain subject to economic and political turmoil for quite some time. No matter who is in charge of Latin America’s largest economy, the immediate stabilisation of the fiscal deficit as well as structural reforms are needed to bring the country back on track. As for reform, there are three key issues: (1) reducing the size of the state and enhancing its efficiency, both in terms of the large welfare state and the size and functioning of state-owned financial and non-financial institutions; (2) improving infrastructures; and (3) improving education, with items (2) and (3) requiring both quantitative and qualitative overhauling. Latin America: "Brazil: Playing with Fire"